Came across this picture at Ruth Gledhill's blog, and thought it very striking. I greatly admire Jeffrey John. He is someone who has immense gifts which he has given to the church in loving service. In return he has been betrayed, abused and calumnied - and he has not given up. He continues to serve the church with loyalty, grace and dignity. He's an example to all of us, and a bit of a hero for me. I hope that one day the CofE can get over itself sufficiently to let him exercise a greater degree of leadership. John Colwell really is a hero of mine. Thank God for him. It is the waste, the appalling waste of Jeffrey John's gifts that I find it hard to forgive. I am sure he is an inspiration to all in his present post, but we are not so awash with great leaders that we can afford not to appoint people of his calibre to the episcopate. Jeffrey John nevertheless teaches a position contrary to Scripture and to the declared position of the Church of England. It is his choice, but he can't really complain about a lack of preferment. Now, now, Mr Richardson. One surely cannot make a comment like "Jeffrey John nevertheless teaches a position contrary to Scripture" without reference to an academic journal, serious newspaper or other authoritative source that provides independent verification? So, Mr Cowell has never been treated abominably by the church and also has little patience with ministers who moan about churches. Why did you comment in that particular way MadPriest? Joe - I think MP means Colwell, not Cowell. MP you might find reading the Colwell book of value - I'm only a little way into it but I think you could relate to it. NB he's a Baptist, not CofE. John R - has Jeffrey John complained about a lack of preferment? I'll engage with the 'contrary to scripture' point in a post. 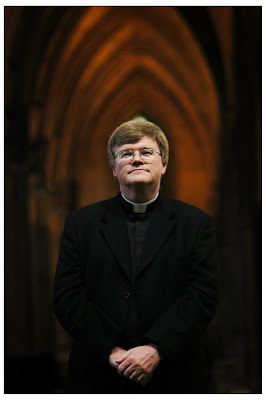 John, surely many others in the C of E have found preferment despite taking theological positions you would consider at least as "contrary to Scripture" as Jeffrey John's. It wasn't his theology which caused a storm when he was nominated as Bishop of Reading. Are you really suggesting that he has missed out on becoming a bishop because of his beliefs and not at all because of his homosexual orientation? There, I have used the "h" word, and so referred to the elephant in the room which everyone else seems to ignoring in this thread.